A three and a half hour drive from Phnom Penh to Sihanoukville on the southwest coast, where we intended to stay for six nights. 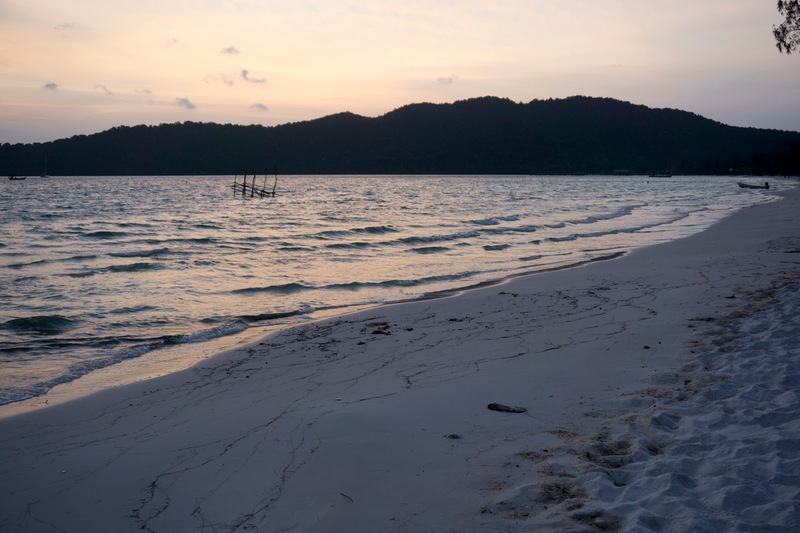 One of those spontaneously ended up being on the exquisite island of Koh Rong Samloem – more on that below. “Sihanoukville? More like Shitsville” said Matt, as we walked past a hanging group of excessively-tattooed Australians inhaling their Full English breakfasts, whilst simultaneously pulling faces hinting at a struggle to keep them down. “This is what Magaluf is like”. A sentence probably best kept out of Sihanoukville’s travel brochure. But he’s not wrong. If your idea of a good time is mingling with sunburnt 20-somethings in oversized vests drinking beer at 11am, men in their late 30’s refusing to act their age or travel by a means other than skateboard (good luck with that on the sand), and bars called No Problem! 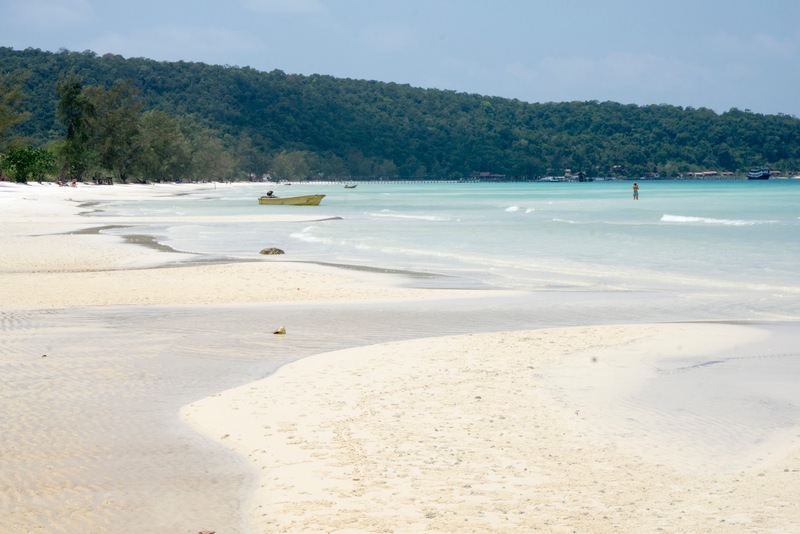 and Utopia that serve a slice of magic mushroom pizza along with your beer (I reckon that sounds better than it actually is), then Sihanoukville is for you. If that’s not really your scene, move on – it has no other sales pitch. Except, that is, people do seem to be making it their home. Foreigners, and normal, functioning ones at that. 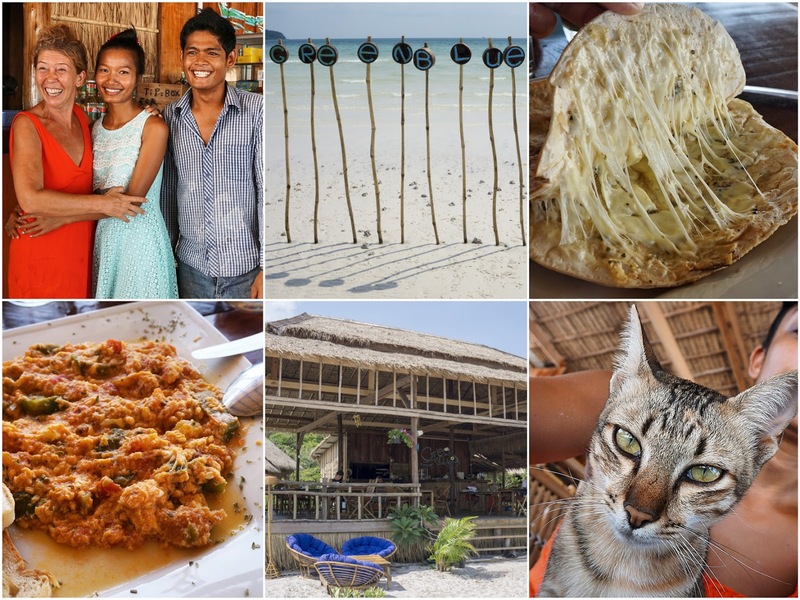 A good example are the Italian husband and wife team running a very good restaurant there (see what to eat in Sihanoukville below). We had six nights here, and after a few hours exploring and finding little of interest on the first day, I resigned myself to a week mostly spent at the laptop in the hotel, catching up on life admin, emails, writing and the rest. 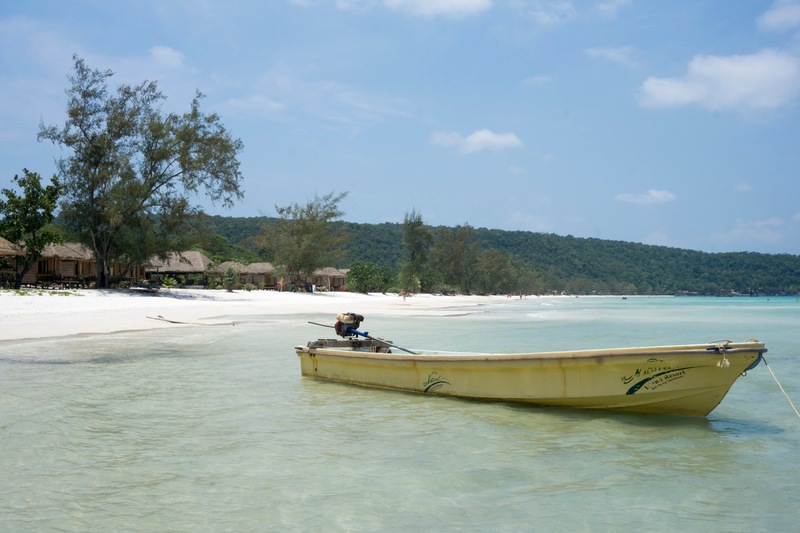 In a last ditch attempt to find something to do, we took a speedboat to spend a day at one of the handful of nearby islands, specifically Koh Rong Samloem. And, oh my. 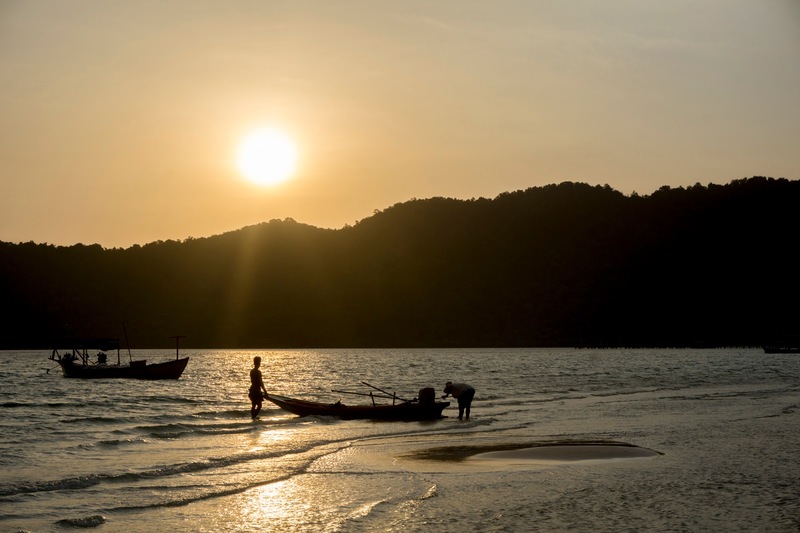 What a slice of paradise so many worlds away from Sihanoukville, it might as well be in a different galaxy. It’s the sort of beach around which films are made. It is utterly exquisite, and I’m not sure we’ll come across another like it (more about the island further down). 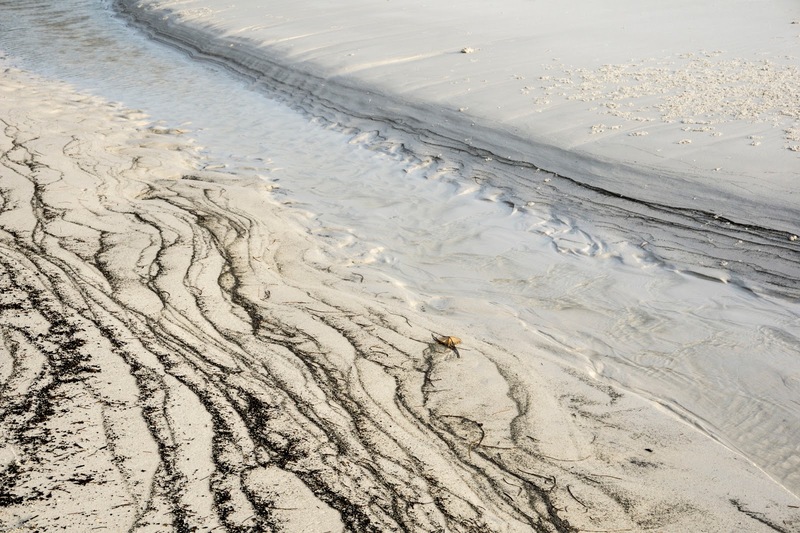 It’s biggest draw has to be the fact that it is still undeveloped – no hotels, roads, or much expansion of any sort. 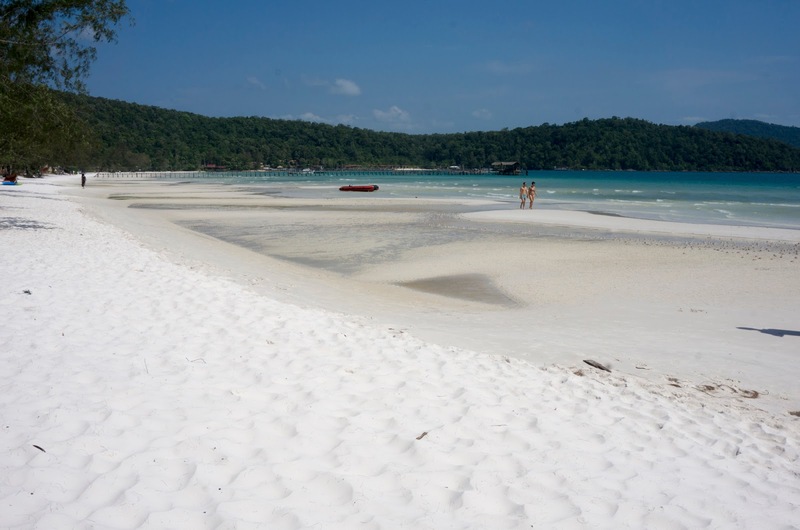 Eye-blindingly white, pristine, soft sandy beaches, backing onto unspoilt Cambodian jungle. 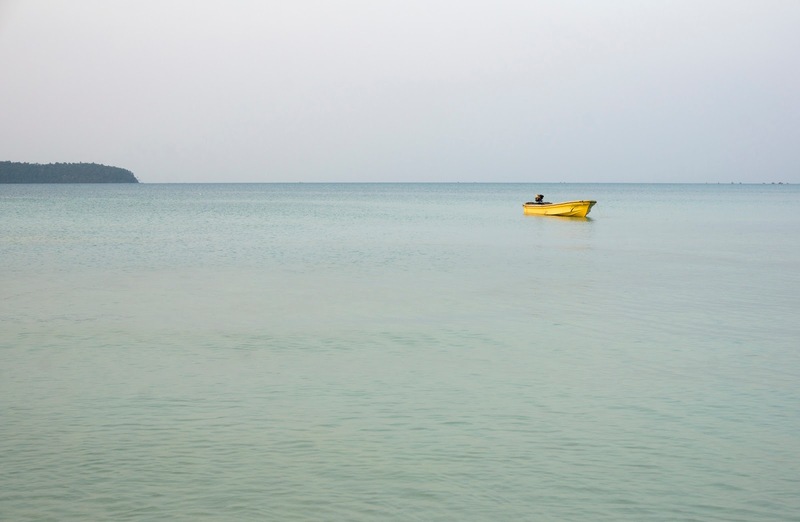 Warm and shallow marine-green waters. And such few people. But be warned, it’s not going to stay this way for long. The island has been earmarked for all sorts – big golf course resorts, hotels and even an airport. It was such a show stopper that we decided to stay the night, at one of the basic beach huts. All we had between us was what we had brought for the day – sunscreen, sunglasses, money and a (thankfully fully charged) camera. No laptop, toiletries, change of clothes, or the rest. It was liberating. Electricity on the island runs by solar panels and generators, only operates a few hours a day and there’s barely any phone signal. We walked along a jungle path and spotted two great hornbills, an osprey, and a macaque making a right racket swinging through the treetops. We fell asleep to the sounds of the jungle and woke up with the sun. The week was well and truly saved. Homely Italian at L’Osteria di Gino. 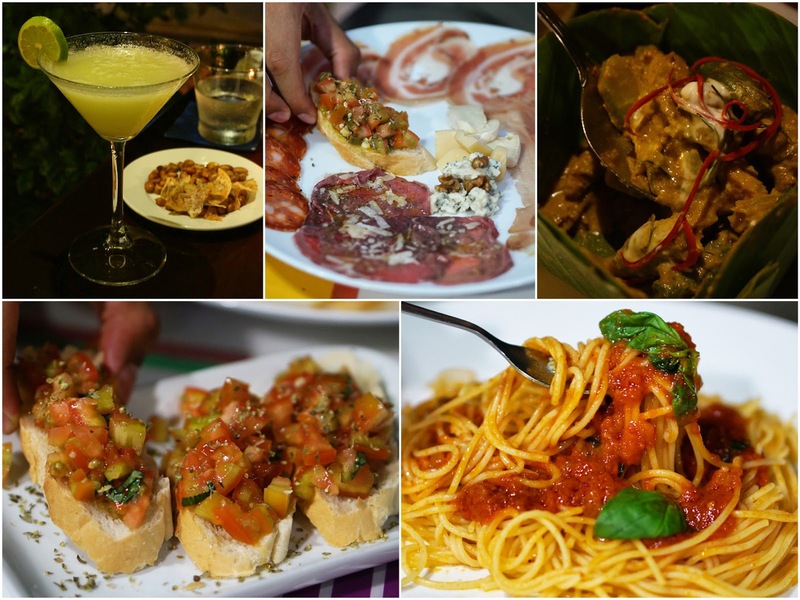 There is a good Italian in town – L’Osteria di Gino. It only has a handful of tables, and the owner and head chef is from Saronno, moving to Cambodia to open the business in 2012. She knows how to cook. I noticed a ‘for sale’ sign outside, turns out they’re moving to a bigger site – a good sign. During dinner, a load of Italian expats scooted up to say ciao (with hot Cambodian wives and girlfriends, and gorgeous kids). Who knew there were so many Italians in Sihanoukville. We ate here on three nights: spaghetti pomodoro, carbonara, milanese, and bruschetta. Oh, the bruschetta. I’VE MISSED GARLIC WITH OLIVE OIL SO MUCH (I might be sick of rice). Khmer food with flair at Sandan Restaurant. 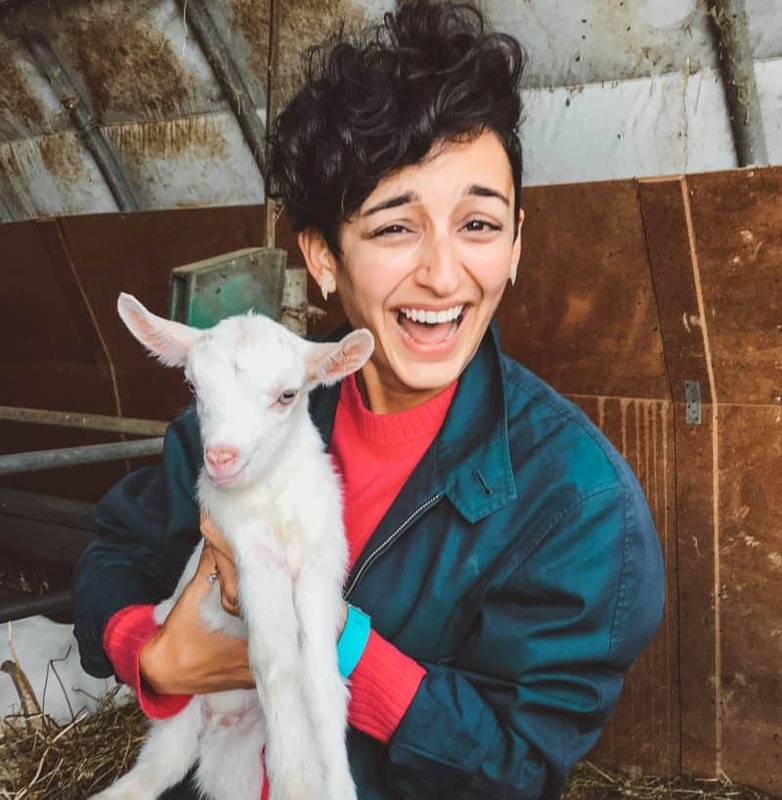 This restaurant is run by the TREE Alliance, a global alliance of training restaurants working to build futures for former street youth, marginalized young people and adults. Really commendable work. They have a few others in Cambodia and also one in Laos. This is the place where I had my near-fainting episode (nothing to do with the food, see lowlight below), but I could still tell the food was good, creative and reasonably priced. Think of almond and guava daiquiris, beef and peanut curry, buffalo lok lak with quails egg and sweet potato fries, and a lot more. Turkish home-cooking in the Gulf of Thailand. Guess how surprised I was to find a Turkish husband and wife team running one of the handful of restaurants on Saracen Bay. I got to eat menemen, borek and adana kebab on a random tiny island in the Gulf of Thailand. What a win. I got chatting to Alev, the wife, who is originally from Istanbul where she and her husband had a restaurant. They’ve been living on this remote and undeveloped island, running Greenblue resort, (a restaurant as well as a few beach huts), for a year and a half. What I commend about Greenblue’s cooking is that they do their best to replicate Turkish dishes with local Cambodian ingredients. For example, whilst the picture below may not look like a borek as we may know it, the flavour was there, let me tell you. And who could say no to that amount of cheese stringiness anyway? There’s also local Khmer cooking, wine, and other western options here, should you fancy it. It’s worth mentioning the reason we first chose to eat at Greenblue was because it was the busiest restaurant on the bay, which means a fast turnover of food – always a good sign. It was only when we looked at the menu was the Turkish side joyfully revealed. 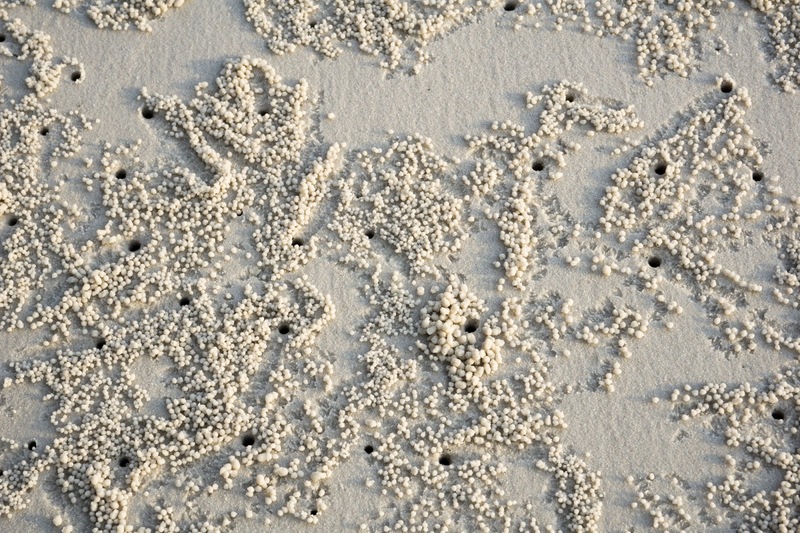 Images from Greenblue restaurant on Saracen Bay, Koh Rong Samloem island. Similar thoughts to last week in Siem Reap and Phnom Penh. 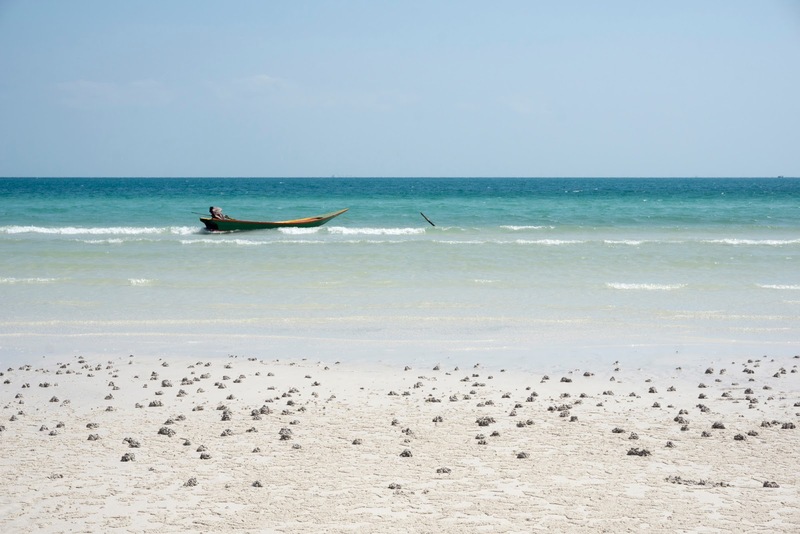 Some insight on Sihanoukville, according to the feedback on this website, written by an expat who lives there, from what I can gather. I’ve edited it in places. “Expats call it Snooky. 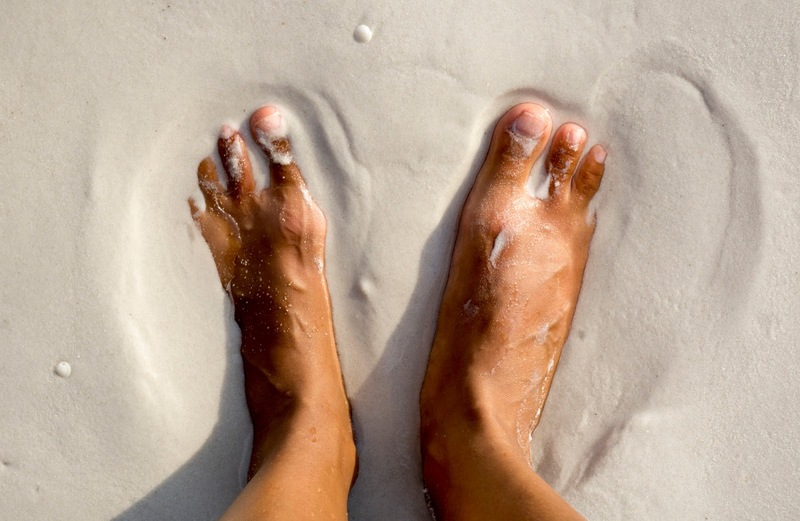 People say it has some of the best beaches around, but they’ve either been sold or are rented to resorts or bars, and so are inaccessible to non-resort guests. The majority of western guests are backpackers and apart from the still open Otres and Ocheteal beaches, there’s not much to do in Snooky. The less favourable characters of the backpacking crowd have taken their toll on the Khmer people who are confronted with druggies, alcoholics, general riffraff and other western exports. 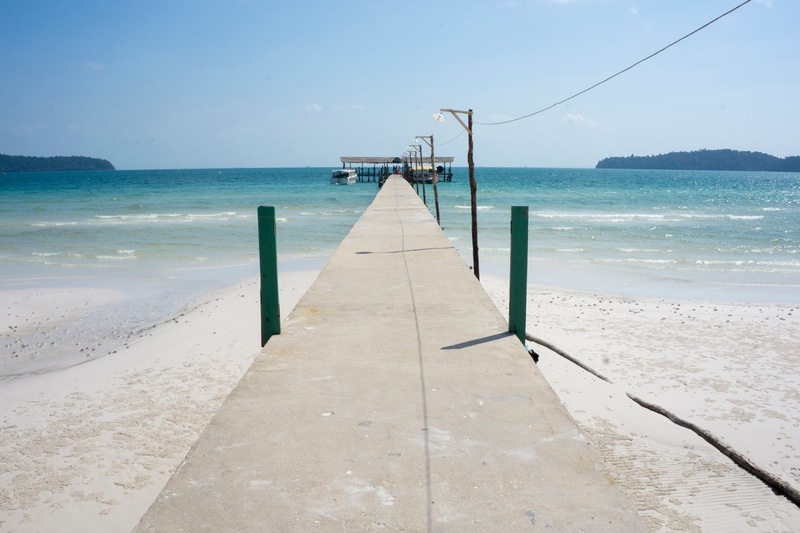 My opinion of the place: it’s a means to get to Koh Rong Samloem. *also referred to as ‘the centre of the backpacking universe’. And doesn’t that just sound like hell on earth. 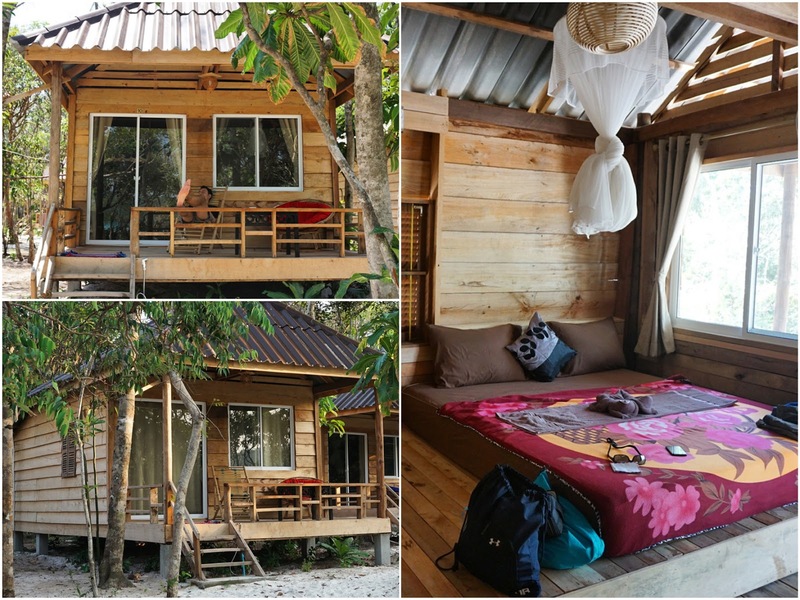 Accommodation in Saracen Bay, Koh Rong Samloem. First point to note, there is another island in these parts also accessible by boat called Koh Rong (almost the same name, confusing). 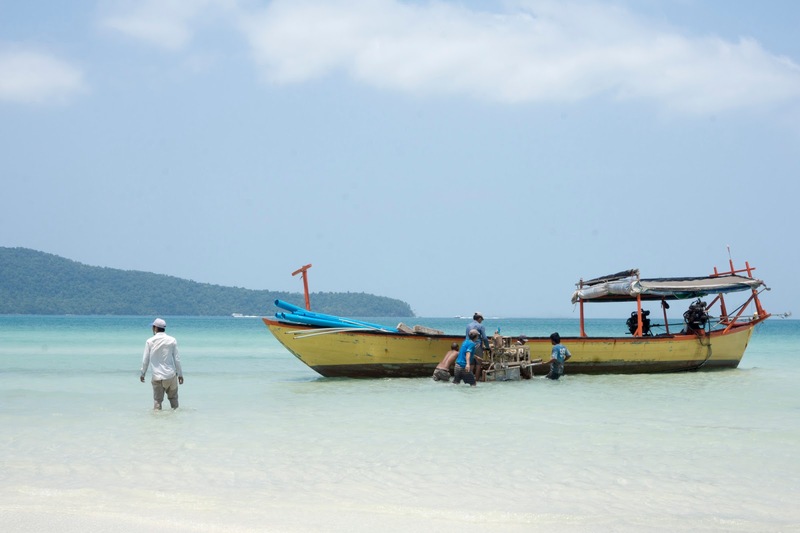 Koh Rong is bigger than Koh Rong Samloem and a lot more developed – this invariably means more people. On the return journey back to the mainland, the speedboat made a stop here to drop some people off. From the limited judgement I could make aboard the boat, I’m glad we went in favour of Koh Rong Samloem and it’s undeveloped charm. 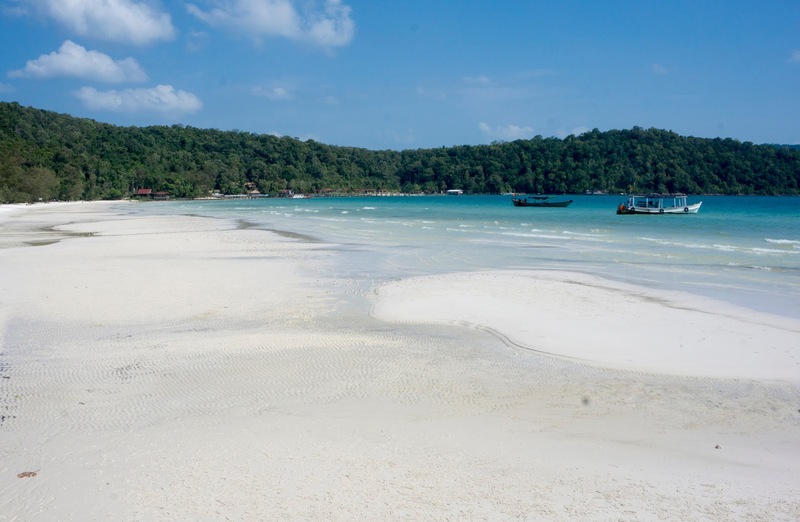 Second thing, here’s the ever excellent TravelFish with their guide to Koh Rong Samloem island, providing a load of insight on where to stay, what to do, and how to navigate your way around it. But my own personal tip about accommodation, specifically in Saracen Bay where the speedboat makes a drop off from the mainland, is the further away you walk from the drop off pier, the cheaper accommodation gets. This is probably because people hauling heavy suitcases would rather not traipse the length of the beach with them under the midday sun, so opt for rooms close to the pier, and pay for the privilege. When we decided to stay the night, I did some traipsing of myself, up and down the beach, to see who could offer the cheapest rate. Near the pier I was quoted $65. Further down at Natural Island, where we ended up staying, it was $50, but I got it down to $40. Quite a big difference for huts that provide the same amenities. 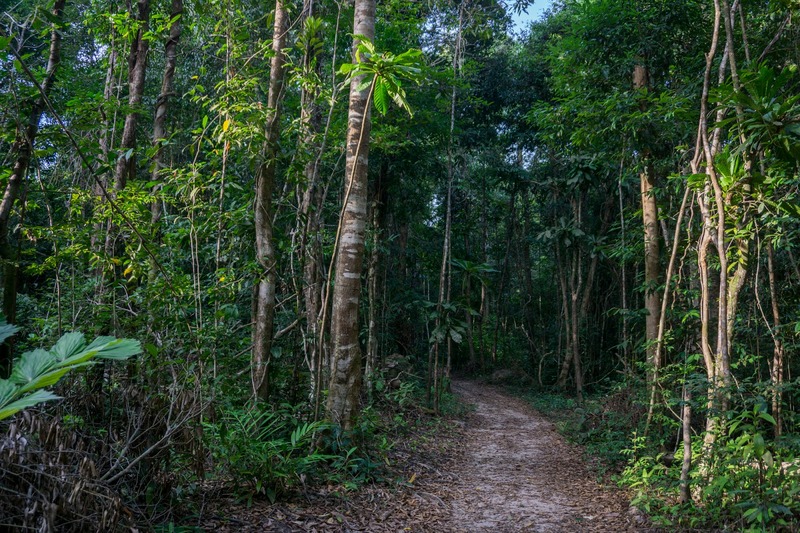 Walk even further down, and you have the option of hiring eco-tents or even just a hammock for the night. Frugal. Highlight. The world’s biggest planners (both Matt and I) spending the night somewhere entirely unplanned, and with hardly anything on me. Spontaneity win. Lowlight. I came over all peculiar during dinner on our first night in Sihanoukville. The closest I’ve come to fainting before was after the first time I gave blood. I didn’t stay horizontal for long enough – rooky mistake. I remember sitting at the biscuit-and-juice table chatting to my friend, when my vision started to go. This was followed by a nurse intercepting my slow slide off the chair onto the floor, and directing me to a bed where she made me lie down and raised my feet. The exact same thing happened at dinner. I felt very strange, knowing that I absolutely had to lie down or I would lose consciousness. But I was still with it and self conscious enough to realise it would look pretty weird if I hit the deck in the middle of a restaurant. So instead, I went to lay down on the floor in the only private place I could think of – their toilet (thankfully, very clean). I had to ask a member of staff where it was though, because I couldn’t really see. I also couldn’t really see the member of staff while I was asking him, so that must have been a good look. After a few minutes I went back to the table, but the black-out wave started to wash over me again. We ended up moving our dinner to the staff sofa out the back, and I basically ate it lying down. I put it down to a combination of not having eaten since breakfast (believe it), going from working in an AC room all day to the heat of outside and not being hydrated enough for the shock, and the first thing passing my lips being a cocktail – whoops. We move to the sleepy seaside town of Kep, a couple of hours drive away, where we’ll stay in a traditional and pretty basic Khmer house on stilts for a week. 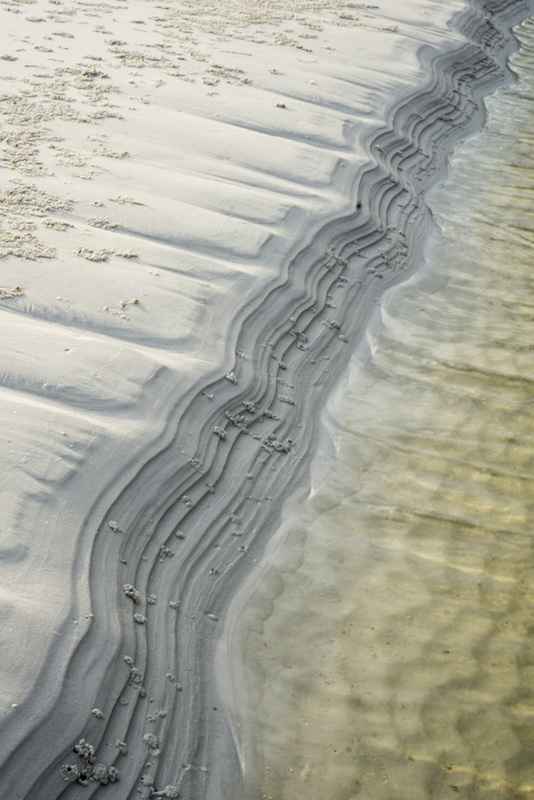 The sea don’t half do pretty things to sand. And why is your sham copy site official? Thank you kindly for this post! 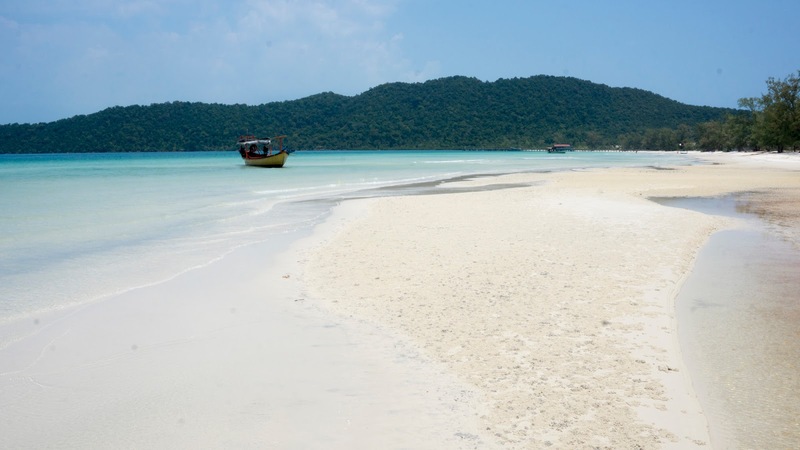 We have been considering Koh Rong Samloem for quite some time now, and your experiences might have been the last push we need. Great read! 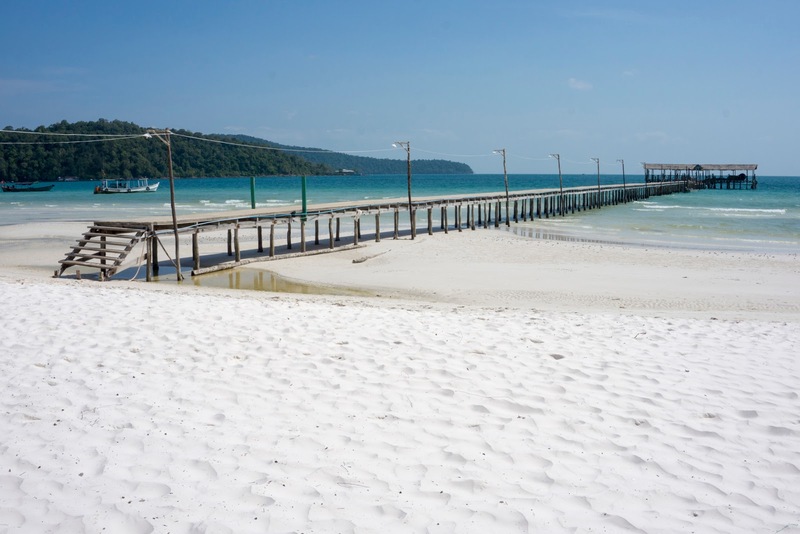 M'Pai Bay in the north of Koh Rong Samloem is the place to visit, you should have dropped in for a an ice cold drink at the beach bar Chill Inn. M'Pai Bay is a local Khmai village with a fishing/squid community. Since early 2015 a handful of backpacker & bungalow places have opened. Also 3 quality restaurants and a dive school. The area has a magical feel, with amazing colourful coral and tropical fish for easy snorkelling, sandy beaches, local kids playing & the undeveloped low scale tourism. Paradise lost. Awesome post! I would love to go there – the nature is stunning! Thanks for sharing!